Pros offer 35 tips covering clinical to EMR to imaging tools. Sourcing, evaluating, selecting and implementing software for any tasks can be one of the most frustrating and mind-boggling issues for clinicians and administrators alike – whether you’re an outpatient surgery center, imaging center or cancer center. Doctors and other clinicians want to focus their attention and time on serving patients at the expense of business decisions, which in today’s healthcare environment is more of a luxury than standard operating procedure. Administrators simply want tools to run their hospitals or outpatient care facilities more efficiently without having to invest too much effort and time in disruptive technology. To help readers make some sense out of the process, Outpatient Care Technology magazine reached out to a variety of experts, including modality vendors, software suppliers and management companies, to offer some effective software purchasing strategies. OPCT gave them the following scenario: If an outpatient care facility clinician or administrator came to you for consulting advice on how to evaluate and select the right – or optimal – software (e.g., business or clinical) what five actionable tips would you give them? As a reader service you can use all year long, here’s what they advised. Assess your needs. Identify the most relevant/pertinent requirements based on the realities of your practice. Look at your plan over the next few years. Make sure your purchase today has the flexibility to grow with you. Ask about the length of time the product, product line and company have been in this business. You should benefit from companies with a lot of experience in this business and in this product specifically. Assess the cost of the solution versus the potential for cost savings, productivity improvements and/or revenue enhancements. You should see a positive return on your investment. Many organizations fail to note the importance of measuring ROI and fail to do it. Ask to visit a current customer; talking with a current user is extremely valuable. 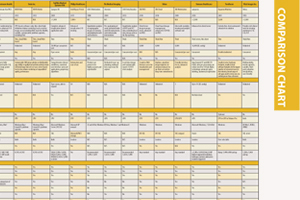 Put together a matrix of all the features and functions you want. Consider where you want to be at least three years out – five years out if it is a big project. Consider the flexibility, expandability and extensibility of the solution because regardless of how well you plan, you will know lots more when you are finished with the project. And as we all know, requirements change over time. Products meeting industry standards will always be easier to extend. So invest time learning about the standards that will allow your system to interoperate with other systems, devices, etc. Put together a description of what you are trying to achieve and send it out to a group of vendors. Ask them for their feedback and recommendations. Listen to what the vendors say they can do for you and reassess your requirements. It’s hard to know you want something if you don’t know it exists. And vendors have a wealth of experience in what can be accomplished with the right tools. If it is a big project and you are thinking of hiring a consultant, make sure to ask if the consultant has any affiliation with any of the vendors. You want a consultant who is looking after your best interests. Talk to other people who have implemented similar solutions to find out what they feel made them successful, what they would do differently after going through the process, ask about any surprises (the good and the ugly), how close their project came to meeting their budget. prioritize them and go back to those vendors with whom you felt most comfortable and start discussions. If you have a precise deadline, such as a new building opening, then tell everyone that you have absolute time requirements and understand the timeline for the vendors to order, test, deploy and train users. Select a proven solution. Software takes years to mature. Be wary of a brand new product. Select a product that is made for your environment. Do not let a vendor sell you on a customized solution. The client rarely gets what they want. Select a flexible clinical solution. One size does not fit all in a clinical environment. It is too difficult to think of all the permutations of your clinical process during a brief demonstration. Select a software vendor that is deeply involved with national and state organizations that help and support ASCs and understands the unique needs of the industry. Select a software vendor that offers much more than administrative software and is a true partner. Ask prospective EHR vendors for references. EHR vendors with successful implementations can provide you with names and contact information of satisfied customers who can tell you about their experience with the product, technical support, etc. Look for a modular product. Different practices have different needs for certain features such as code databases, document management functions, etc. Look for products that will allow you to pick (and only pay for) the features you need. Ask for detailed cost estimates including start-up, maintenance, etc. Ask prospective vendors for details on what you can expect to pay beyond the annual or monthly license fee. Depending on the vendor, specialized hardware requirements, mandatory annual upgrade fees and the like can add up to thousands in unanticipated costs. Make sure the product interfaces with labs and other providers. Data interoperability with ancillary providers is one of the primary value generators for an EHR. Make sure your provider has existing interfaces to major diagnostic labs, for instance, and built-in HL7-compliant messaging capabilities to meet your interoperability requirements now and in the future. Involve your staff in demos, seek their input. Buy-in and commitment from your staff is critical to the success of your EHR implementation. Get them involved in product demonstrations and other aspects of your product research. Take their input seriously as they know how your practice works and can provide valuable insight into your decision. Do your research, then formulate specific objectives before purchase. After completing your research, make sure you have a concrete set of objectives for your EHR implementation. Are you looking to see more patients, reduce costs, etc? Determining exactly what you want to achieve will be invaluable in choosing the right product for you. Include time, and budget for training. If your implementation gets off to a good start, your staff will feel comfortable and confident that your EHR will help them do their jobs better. In order to make this happen, appropriate training is a critical component of your implementation. Get detailed information on support services offered including hours offered and cost. Technical support definitions, costs and availability can vary widely from product to product. Make sure you can get the technical support you need, when you need it. Always look for the CCHIT Certified Label. With so many products to choose from, limiting your search to CCHIT-certified products is a good place to start. CCHIT certification provides a real assurance that the product you choose meets recognized standards for functionality, security and interoperability. Ensure it is based on established standards that would enable your facility to grow into the future and be interoperable with other applications, both planned and unforeseen. Buy from a company that can customize to meet your workflow. Ensure that the organization has a good track record, an adequate service model and the ability to keep you up and running in any circumstance. Trial the software before you buy it. You can only really determine if it will fit your needs if you trial it in the same setting as you will use it. If the above is not possible, get good references from sites that are as close as possible to your own – visit the sites and establish the good, bad and indifferent and measure these against your own priorities. In summary: You only get out of it what you put in – if you don’t invest your time and energy, set the right expectations up front and dedicate time to planning and implementation the project is sure to disappoint. Can the company selling the software provide references of customers who have implemented the software and demonstrated high levels of user adoption? Does the company guarantee the business objectives of the software? There is no doubt that an electronic medical record system can deliver remarkable benefits to a practice. EMRs offer tremendous potential to improve quality of care, streamline workflow and increase profitability. Yet all EMR systems and all vendors are not created equal. With hundreds on the market to choose from, finding the right fit for your organization can be a bit daunting. Rather than search for the needle in the haystack, follow these tips to accelerate your search and find the right solution for your needs and budget. Research well before you buy. There is not one perfect EMR for every kind of practice. This is where diligent research and referrals come in handy when choosing an EMR for your own practice. The return on your investment and the increase in the quality of care you can provide to your patients makes investing in an EMR a very worthwhile experience. But choosing a system that does not fit your organization’s needs can cause a bigger headache. Talk to friends or colleagues who have recently implemented a system. If you have the time and budget, it may be worthwhile to hire a consultant to help you manage the EMR selection process. Know your objectives for purchasing an EMR. Know exactly what your organization would like to accomplish by implementing an EMR. With so many options out there, the only way you will get the best system for your organization is to know what your organization needs. Are you looking to improve quality of care, increase profitability, share information across care settings, or accomplish all of these goals? Today’s EMR solutions are very sophisticated, but beware of vendors who promise you the world. The vendor you choose should be able to clearly show how their solution meets your needs and how your business will improve by using the application. Choose a vendor that offers interoperable solutions for sharing patient data. The U.S. government has called for the universal adoption of electronic health records by 2014 and the creation of a fully interoperable national electronic health system. Make sure the healthcare IT vendor you choose offers a fully interoperable solution and is active in committees that support interoperability initiatives, such as CCHIT (Certification Commission for Healthcare Information Technology) and the Electronic Health Records Vendors Association. This will help ensure that the solution you choose meets national standards for functionality and interoperability and will be a solid investment now and in the future. Choose a stable vendor. The EMR marketplace is volatile and evolving constantly. Several well-developed U.S.-based EMRs have disappeared or merged with competitors in the past several years. Find out how long the vendors you are considering have been in business and if they have a history of growth. Related to that, with the pace that EMR technology is evolving, you’ll want to be sure you choose a vendor that has the research and development budget to keep their product up to date with current industry regulations and certifications. Always ask for references. Once you have narrowed your list to a few vendors, ask them to supply you with a list of references, preferably in the same specialty as your practice. Also, make arrangements to visit reference sites. Ask questions that will help you decide if the software is right for your practice. Be sure to ask about the product, the implementation process and the service they received before, during and after they chose their EMR. When you are done with the reference call or site visit, you should feel without a doubt that your vendor of choice will treat you as more than a sales opportunity, but as a true partner.